The ATSC 3.0 Advanced Emergency Information system enables broadcasters to deliver timely, in-depth emergency-related information to their viewers, which can strengthen the connection between the audience and the station and provide critical information in times of need. The system includes methods for waking up devices in stand-by mode, message targeting, rich media delivery and more. In this webinar attendees will learn about the elements of the ATSC 3.0 standards that enable advanced emergency messaging, along with methods and examples for implementing the system features. Madeleine Noland received her Bachelor of Music from the University of Massachusetts in 1989. She began her career in the television industry in 2004 with Backchannelmedia, Inc., an interactive television technology developer. In early 2013, Noland joined LG Electronics with a focus on development of industry standards and guidelines. Noland participates in a variety of industry organizations on behalf of LG Electronics, and has served in leadership roles within the ATSC 3.0 project. She was recently selected to succeed Dr. Rich Chernock as the next TG3 chair for ATSC 3.0. Noland also serves as chair of the Guidelines Work Group within the Ultra HD Forum and chair of the ATSC Advanced Emergency Alert Implementation Team. Ms. Noland was the 2016 recipient of the prestigious ATSC Lechner Award for her leadership roles related to the development of the ATSC 3.0, Next Generation Broadcast Television suite of Standards. Registration for each module will be done separately. Click Register Now below, to register for Module 6. Questions? If you have questions regarding this webinar, contact Cathy Orosz via email or by phone at 317-846-9000. The ATSC 3.0 Series, like all new SBE webinars presented in 2019, are included at no additional cost for members who renew or join using the $175 SBE MemberPlus membership option. 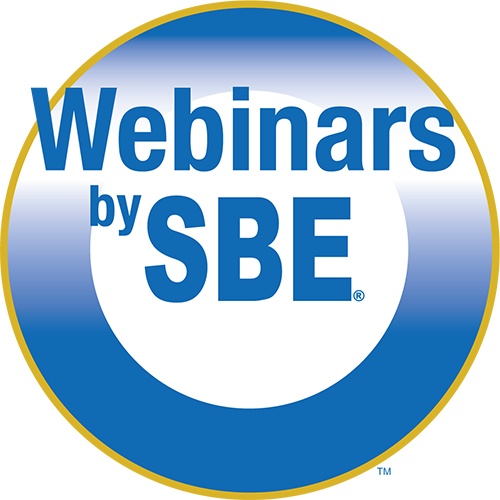 You get all ATSC 3.0 modules, plus access to all archived SBE webinars and any new live webinars SBE presents through March 31, 2019, all for no extra cost. Members can renew and newcomers may join online at the SBE website using the SBE MemberPlus option.